Victoria is undoubtedly home to some of the world’s most famous surf breaks. Whether you’re here to catch the pros at the annual rip curl pro at Bells Beach or learning to surf on a foamy down at Point Roadknight, the Surf Coast has swell for all skill levels. Surf breaks close to Freshwater Creek Cottages. Bells Beach is a coastal locality of Victoria, Australia in Surf Coast Shire and a renowned surf beach, located 100 km south-west of Melbourne, on the Great Ocean Road near the towns of Torquay and Jan Juc. It is named after John Cavert Bell of the family that first took up a pastoral run there in the 1840s. Bells Beach is Victoria's most famous surfing beach and one of the world's great surfing breaks. The excellent break is due to a combination of clean waves, that have refracted around the Otways, and particularly a gently sloping limestone reef off the southern point that produces one of the world's best right handers. Although the final scene of the film Point Break is set at Bells Beach, the scene was not filmed there. Learn to surf in Torquay. Torquay is the surf capital of Australia with all the massive big name surf shops and the world famous Bells Beach just around the corner. Go Ride A Wave surf school specialises in daily beginner surf lessons. Group and private lessons are also available on request. 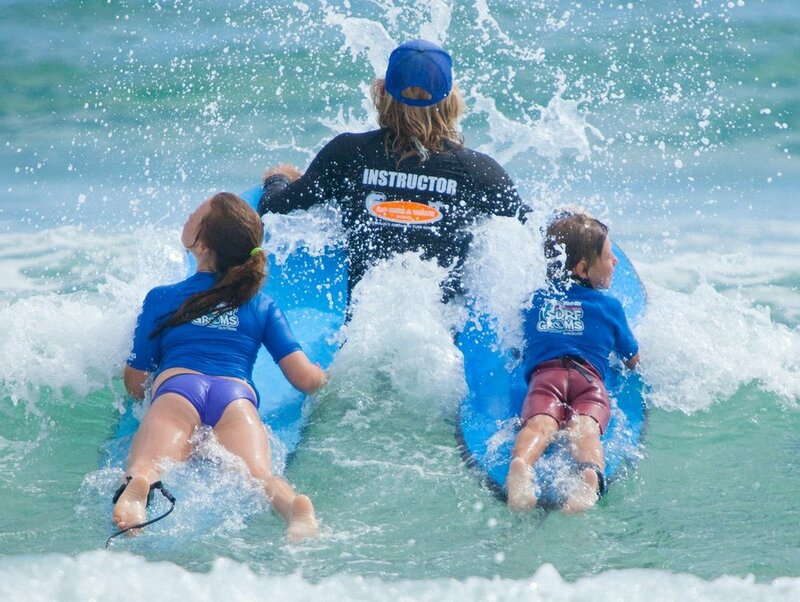 Torquay learn to surf is run by Go Ride A Wave, Australia’s favourite surf school, established in 1987. The shop is the closest shop possible to the beach. It is only a short walk for either lessons and hire. Point Roadknight is next beach past Anglesea. The point and its reef protrude 500 m to the east and afford considerable protection to the beach. The beach is 700 m long and faces north-east. It lies between the slippery Soapy Rocks and the point. There is road access to the back of the beach, a large car park, a boat ramp and a yacht club.Waves reaching the beach average less than 1m making it a favourable place for beginner surfers.